Here’s a question nobody’s been asking (but should have). Where are all the Charles Stross audiobooks? Stross’ novella The Concrete Jungle won the Hugo award for its category in 2005. Accelerando won the 2006 Locus Award for best science fiction novel.Glasshouse won the 2007 Prometheus Award. The novella Missile Gap won the 2007 Locus Award for best novella. His novels Singularity Sky and Iron Sunrise garnered back to back Hugo Award nominations in 2004 and 2005. Am I missing something here? 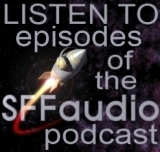 Is Stross not due for some more professionally made audiobooks? In anticipation of a big flood of Strossian goodness over the next couple of years I’ve just now made a CHARLES STROSS author’s page, where I’ll put up details of all the Strossian audio we know about. And speaking of audiobooks we want to see made… Tim says… he wants to see The First Law series by Joe Abercrombie audiobooked. Iron Sunrise is due from Recorded Books in June. On the top of my audio want list: The Book of the New Sun by Gene Wolfe. Iron Sunrise but not Singularity Sky? Who knew you had such power? Here it is, merely one day after your request, and the rights have been acquired by Recorded Books. Amazing! I recorded Halting State by Charles Stross a couple of months ago for Recorded Books, I do not know when the release date is. Great! We will have to follow up with a list of all the releases since this post! There is now a copy of “Singularity Sky,” Charles Stross, as read by George Guidall. The recording is from Recorded Books, and was released in 2009. There are 6 Charles Stross audiobooks available on http://www.netlibrary.com. If your local library has an agreement with this site, you can get a userid/pswd at your local library and download the audiobooks for free. I just listed to Halting State. Well done RIM – you have an amazing voice! Available books: Atrocity Archives, Halting State, Jennifer Morgue, Singularity Sky, Iron Sunrise, and Glasshouse. All are unabridged. Rule 34 isn’t coming out until September, and yet the hardcover is out now.